The Rolling Stones wanted it, Bob Dylan promised it and now Mount Pleasant can claim it in the form of an enticing restaurant and bar. The Shelter Kitchen + Bar provides patrons a haven from the ordinary with a laid-back atmosphere and good food and drinks. 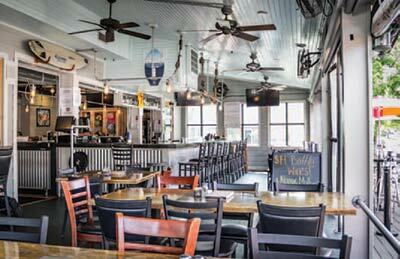 On any given day, the large outdoor seating area is filled with customers who flock to this popular hangout near Shem Creek. The Shelter is locally owned and operated by Ashley Berry, her brother Thomas, longtime friend Ryan Kaufmann and his father, Dave. “As locals, we just wanted a place where you could sit outside that had affordable drinks and friendly service,” said Ashley, who was born and raised in Mount Pleasant and has a master’s in International Business. What started as an idea between close friends in January 2012 quickly became reality when an ideal property became available in April. The restaurant opened in September. 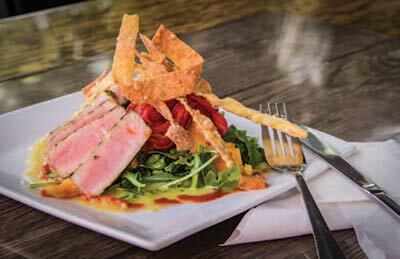 The mouthwatering menu features a variety of appetizers, burgers, sandwiches and entrees, with an emphasis on Southern staples and regional cuisine. Now a dish off the delicious menu can be enjoyed at home thanks to The Shelter’s convenient delivery service. For those with relatives visiting or with hectic family schedules, just call or order online – anytime from 11 a.m. to 10 p.m. on the weekdays and 4 to 10 p.m. on the weekends – and specialties such as local fried shrimp or Lowcountry boil can be delivered right to your door. The Shelter also offers full-service catering for all events, from small corporate luncheons to wedding receptions. Ashley, who oversees the catering, said she enjoys working with clients through the entire process – from planning to preparation to the final product. No bar would be complete without live music, and bands perform a mix of rock, alternative, reggae and bluegrass on the weekends. The business currently employs 50 to 55 people, according to Ashley, including 12 bartenders, 16 to 18 servers and many talented chefs and kitchen staff. Ashley attributes the success of The Shelter to hard work and the support of family, friends and their loyal following of locals and tourists. “We’ve built a place that we’re proud of, so it’s rewarding when people choose to hang out here or when visitors tell us that they make sure to come back each time they’re in town,” she said. “That’s the ultimate compliment.” The Shelter is open Monday through Friday from 11 a.m. to 2 a.m. and Saturday and Sunday from 9 a.m. to 2 a.m. The kitchen serves food until midnight during the week and until 1 a.m on weekends. Don’t miss their popular Saturday and Sunday brunch, from 9 a.m. to 3 p.m. The Shelter Kitchen + Bar is located at 202 Coleman Blvd. in Mount Pleasant. To learn more about the restaurant and its catering capabilities, visit www.theshelterkitchenandbar.com or call 843-388-3625.